An informal and friendly prediction game. All predictions in this thread will go into a league table for the forum Prediction Game. 1. You post once in the thread your Score prediction, including name of first goal scorer, if any. You cannot edit your post; if you wish to change your mond before kick-off then post again. Your latest post will over-ride any earlier one. 2. If you predict the exact score correctly and the name of the first goal scorer (us or opposition) you get 5 points. If you state 0-0 then no name is necessary. 4. 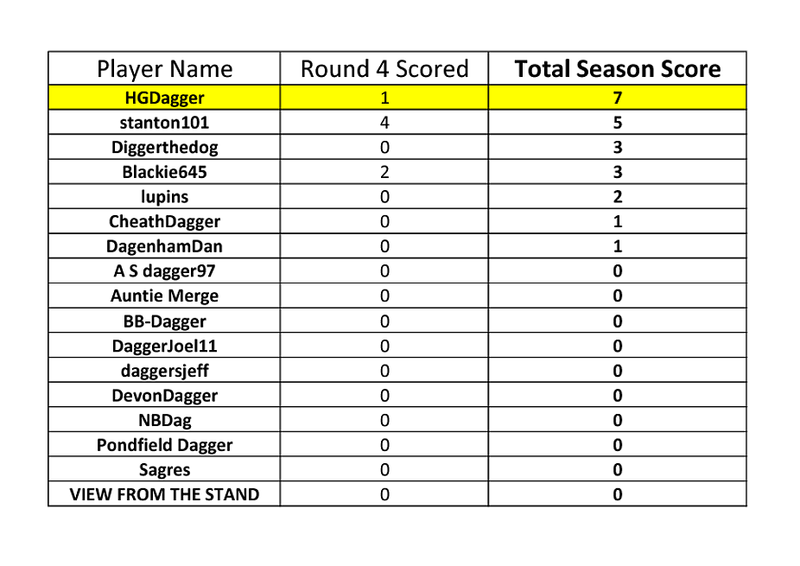 If you get the result right (win /draw / lose) and get only Daggers goal tally right you get 3 points. 5. If you get the result right (win /draw / lose) and only get the opposition goal tally right you get 2 points. 6. If you get the result right (win /draw / lose) but nothing else, you get 1 point. 7. Wrong result or failure to predict 0 points. 8. This will all go into a league table. No prizes for the winner during this trial. No predictions after 2.55pm /19.40 pm as applicable. "May the best of your past be the worst of your future"
Beginning to wonder whether some of us will manage to even scrape a single point before Christmas! Gap slightly narrowed at the top thanks to stanton101's correct 2-1 prediction.